Tags: community, Inspiration, Outreach, Quinn, Randy, Support. Quinn's name tag as an honorary Lions Club member. While “I am Lion” as I write this feature, I’m ever so proud to be a part of an excellent group and suggest you might find similar “pride” by joining us. 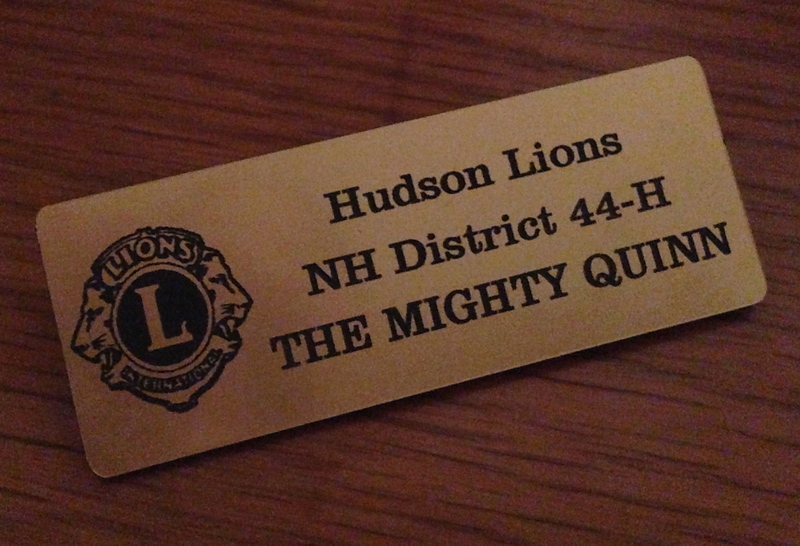 I am a member of the Hudson NH Lions Club after joining Nottingham West and being welcomed completely by our local club several years ago when hard times led to the closing of our original club. Lions are the largest service organization in the world, accomplishing tremendous things in their local communities, nationally, and beyond, while holding strong support to their early origins as “Knights for the Blind” at Helen Keller’s request of them back in June of 1925. I’ve shared time and company with many great and vastly differing clubs from Litchfield, Meredith, Atkinson, Canaan, Portsmouth, Chester, Concord, Souhegan Valley and well beyond. Each club has differences in membership numbers, age, and approach but all have a constant commonality as well which is an adherence to their motto “We Serve.” I’ve been delightedly surprised numerous times when encountering people such as Pete and Christine Houde who are reaching out to help in some fashion only to discover afterwards we share membership in the Lions organization. The Hudson, NH Lions Club sponsors important efforts such as the Lions International Peace Poster Contest in local schools and youth groups. 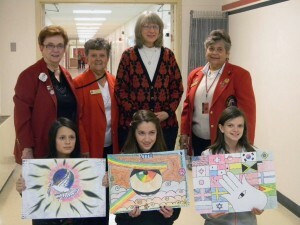 Winners at Memorial School illustrating the theme, "Our World, Our Future." My own club has remained my closest role model for friendship, camaraderie, and fun, all while working towards the opportunity to make a positive impact in the world. It was little surprise they immediately made Quinn an honorary member and later welcomed my wife Tracy when she was ready to join us as well. I put an inordinate amount of effort into our 2020 Vision Quest charity and the organizations we support, NHAB and Guiding Eyes, and yet I find it satisfying and gratifying to make the time and choose to be an active member in Lions. I hope all of you reasonably local to me would consider joining with me and attending a meeting at our club, perhaps discovering that you too could benefit from and be a benefit to the efforts we undertake in making a difference in the world. Should you not be sufficiently local, perhaps you can seek out your local club and tell them you’ve heard from me there’s a great opportunity and you want to explore if it’s right for you. There are many great causes and many great organizations out there. It can often be all too easy to be complacent in our lives or realistically busy enough we don’t choose to make the time for one more thing. It’s honestly not the right choice for everyone and yet I know there is more than enough need to warrant the effort. I know that near you there is a Lions Club waiting and willing to welcome a new member to a team of people who will give more than they ask of you in ways which for me is worth the choice to belong! So how about it–will you join me? Connect with the Hudson, NH Lions Club on Facebook.